Final group games for Group C & D, let’s recap today’s action. This match had a lot riding on it, with Uruguay needing a win and Italy needing at least a tie to advance to the round of 16. The first half was very uneventful. Italy controlled the ball and possession for most of the first 45 minutes but didn't create any real danger. One shot on net by Balotelli that went wide was the only real chance of the first 45 minutes for Italy. They managed a few crosses into the box but nothing that created any real goal opportunities. Uruguay was having difficulties building their play and most of their offense came from dead ball situations near the box, with either corners or free-kicks. Their midfield wasn’t able to make quality passes and when clearing the back lines the defenders would just use long kicks forward that were easily handled by the Italian defenders. Their best chance came from Suarez but Buffon was up to the task. At halftime the score line was 0-0. The second half started almost in the same fashion the first half had ended, with both teams stuck in their own halves afraid of making any mistakes. It wasn’t until Marchisio saw a straight red card in the 59th minute that the game finally opened. Uruguay had the man advantage and needing to go for the win since that was the only result that matter for them. Both teams seemed poised at going for a goal and the game was fluid on both ends. Uruguay always looked more dangerous and around the 70th minute mark they had full control of the ball and the game. 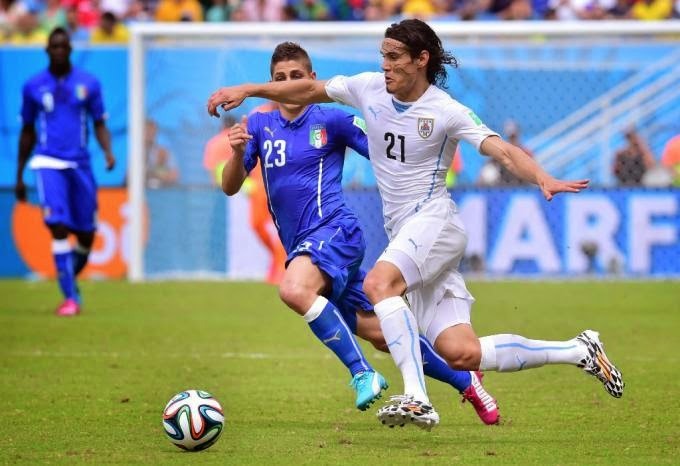 Italy was down to their defensive duties and the ball was barely coming out of the Italian midfield. This wouldn’t be a game if Suarez didn’t get his name mentioned, but this time it was for all the wrong reasons when he bit Chiellini on the shoulder and the big Italian defender elbow him in retaliation. The referee didn’t see it, and neither did the linesman. The play continued and you had a feeling that something was about to give for either side. At the 81st minute, from a corner on the right, Godin jumps higher than everyone else and with his back puts the ball in the back of the net. Uruguay had the lead in the game and the 1 man advantage. Only 9 minutes left in regulation and a huge mountain to climb if you are Italy. The roles reversed and now it was Uruguay defending with 10 men behind the ball and Italy pushing for a late equalizer that would see them through. Uruguay was able to handle Italy and even in their moments of desperation the Italian squad was never able to cause any real danger for Muslera. 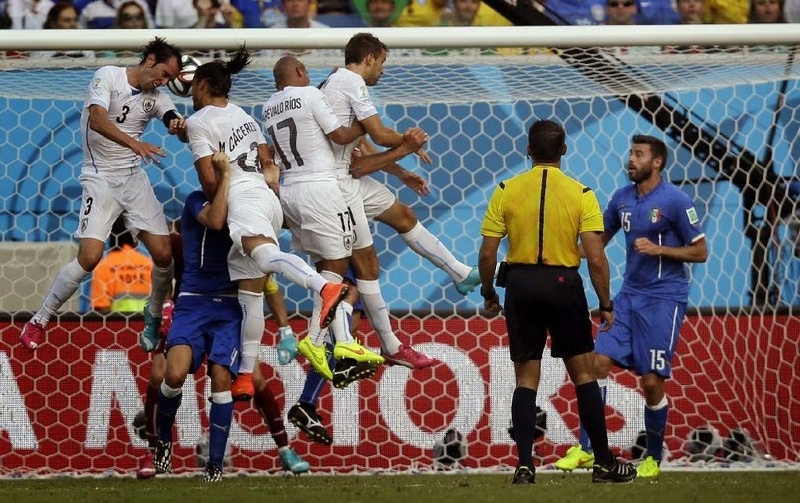 The referee would give 5 minutes of extra time, but that wasn’t enough for Italy to mount a comeback. The final score was 1-0 for Uruguay, and they will advance with Costa Rica, while Italy and England are going home. In a match that meant very little for the squad from England after they were guaranteed elimination with two losses in their first two matches, manager Roy Hodgson made nine changes against surprise group leaders Costa Rica. The changes were meant to provide the younger England players with some important World Cup match experience against the Ticos who were already guaranteed promotion to the round of 16 for just the second time in the country’s history. England started a bit flat, with Costa Rica looking the more energetic side. The Costa Ricans needing just 1 point to qualify out of group D in first place pushed forward early in the match whenever they had a chance. In the 24th minute a Costa Rican shot saw replacement English keeper Foster make a good save, the first real scoring chance for either team in the first 25 minutes. England striker Daniel Sturridge looked most likely to score for the Three Lions, but his two shots early in the half both sailed wide of Costa Rica’s goal. In the 27th England were appealing for a spot-kick after Sturridge fell rather easily inside the Ticos’ box, but the referee would have none of it. England pressed a bit more in the latter stages of the half and the game opened up a bit with both squads creating some chances, but not able to put them away. In the second half it was England who looked “in the mood” with a few good attacks into the Costa Rican box, none of which however made it into (or even onto) the Costa Rican goal. In the 58th minute another good chance for the Three Lions as Adam Lallana made his way into the box, but his cross pass towards Daniel Sturridge was intercepted by the diving Costa Rican goalkeeper. Daniel Sturridge looked to be the hero of the match in the 65th receiving a great pass putting him one on one with the Costa Rican keeper, but the Liverpool striker put his “point-blank” shot just wide of the far post. The game did seem to open up just a bit but neither team was able to create any kind of solid chances and after 90 (+3) minutes the scoreboard read a final score of 0-0. England crash out of the 2014 World Cup in last place in group D, while the Costa Ricans pick up an unlikely 7 points and finish ahead of the other three squads in their group. A match that promised to be at least a bit exciting in an otherwise fairly dull group (maybe with the exception of Colombia), as both Ivory Coast and Greece were hoping to secure the second spot in the round of 16. It was not a spectacular start by either squad, and in the 12th minute Greece were already forced to make a change as midfielder Panagiotis Kone seemed to have pulled his hamstring and was unable to play on. But despite the two early forced substitutions, the Greeks looked stronger of the two sides, keeping the ball in Ivory Coast’s zone for much of the first half hour. The Ivorians did have chances of their own, but the Greek defense seemed up to the task, getting multiple penetration attempts away. In the 33rd minute, just after a corner-kick for Ivory Coast the Greeks found a the best scoring chance of the match so far, with a counter attack providing the Greeks with a shot from just outside the box, but although the string strike beat goalkeeper Barry, it did not go in as it struck the crossbar. After a flurry of attacks by Ivory Coast that did not provide the opening goal of the match, a silly giveaway in their own zone put the ball at the feet of Georgios Samaras who made no mistake placing the ball perfectly at the feet of substitute Andreas Samaris for a one on one with the Ivorian goalkeeper and Samaris slotted it to the back of the net, giving the Greeks hopes of advancing to the round of 16. In the second half the Greek defense stayed strong, stopping two dangerous Ivorian attacks in just the first 5 minutes. In the 59th minute it was the Greeks with a good attempt on goal, but Ivorian keeper Barry made an athletic save. With just half an hour to go, it was starting to look very likely that Greece would be picking up their first spot in the World Cup round of 16 as their defense looked mighty. In the 68th minute the Greeks almost put the game away as a long, powerful shot from Karagounis found the crossbar. But in the 74th it was Ivory Coast with a response that would possibly crush Greek dreams as Gervinho turned provider with a good cross-box pass to Wilfried Bony, and the Swansea forward tapped the ball into the Greek net. With 15 minutes left in the match, the Greeks pushed forward for their last chance at group stage glory. In the 90th (+1) controversy, as the referee points to the spot after Georgios Samaras is clipped inside the box, penalty-kick for Greece and a last minute chance to qualify to the next stage. Georgios Samaras made no mistake from the spot with a good shot to the keeper’s left. Greece through to the round of 16 for the first time in the country’s history, while Ivory Coast go home with broken hearts. In what had so far been a disappointing World Cup for Japan, after an opening loss to the Ivory Coast and a stale 0-0 draw to Greece the Samurai Blue could still advance with a win against group leaders Colombia. However with 15 minutes on the clock Yasuyuki Konno tripped Adrian Ramos just inside the area and the referee pointed to the spot. Juan Cuadrado fired home the resulting penalty to give the South Americans the lead. Japan pushed on in search of an equalizer and on the stroke of halftime Okazaki leapt to head in a cross from Honda to put his side level. Colombia regained their advantage in the 54th minute though when the brilliant James Rodriquez set up Jackson Martinez for Colombia's second goal. As Japan committed men forward in a futile attempt to save their campaign, Martinez punished them on the break in the 82nd minute to put the match out of reach. Rodriquez capped a terrific performance with a fourth goal for his side in the 89th minute. After an incredible picks day for Kon yesterday, his Nostradamus-like skills vanished as he was unable to predict one correct outcome. Iain picked the correct outcome of two matches, including the exact score of Uruguay's win over Italy. But the winner on the day was Pedro, guessing the outcome of three matches right, and also predicting a 1-0 win for the Uruguayans.